It is the merit of Bernstein's portrait of Kawakami Hajime that he emerges as a recognizable human being, a truly modern figure reflecting in his own life a personal and hard-won balance between traditional Japanese values and the demands of modernization. The heir of a samurai family, an acknowledged authority on economics, a professor at one of Japan's leading universities, an early popularizer of Marxism in Japan, a Japanese Communist on his own unique terms, and, finally, the author of an autobiography that is a classic of modern Japanese literature, Kawakami Hajime is an important figure in the history of modern Japan. 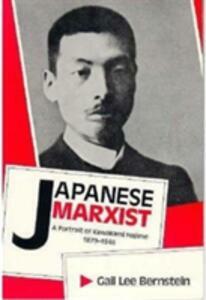 At each stage of Kawakami's winding path to Marxism--from patriotic nationalist to academic Marxist to revolutionary Communist--his concern for the ethical and economic problems that emerged in the course of Japan's astonishingly rapid industrialization dominated his consciousness. Bernstein provides a portrait of Kawakami's complex personality as well as an elegantly shaped narrative of the context and content of Japanese left-wing politics in the 1920s, and she makesplain the kinds of cultural conflict that modernization, in its several varieties, bequeathed to Japanese intellectuals.